One morning on the ride to high school—it was probably junior or senior year—my friend Marcus’s mom sympatheti- cally asked how finals were going. Brushing off her pity, I told her finals were my favourite time of year. The school day is shortened, there’s no teacher talking at you, and the general feeling around campus is calmer and more low-key. Marcus’s mom looked at me like I was an idiot and said something along the lines of, “I guess there’s a few in every bunch,” but I stand by what I said. And it turns out I feel that way about Samoa too. I admit the image of me feeling pleasure as my students miserably sit down for hour after hour of tests is a little maniacal. 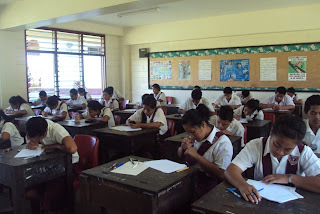 But it’s not aobut the misery of the exams, it’s about the atmosphere and the feeling of being in the home stretch. The year 13s are literally camped out in a couple of classrooms cramming and cat-napping. It’s a lot like being in a university dorm where different students have different exams at different times; whenever you’re not scheduled for a test, you’re lounging with friends, quizzing each other on valence electrons and political theory. And when you get hungry, you simply run down to the mess hall (e.g. the umu cooked by a couple of boys from year 12). Life could be a lot worse. The stakes are high for the year 13s though. 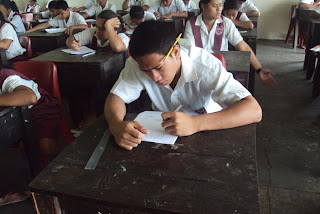 The Pacific Senior Secondary Certificate exams determine whether or not they move on to university. In that sense, stress levels are high. But by the time they’ve made it to year 13, they’ve had their lives determined by their test scores for quite a while. The rank of the underclassmen (i.e. 11.1, 11.2, 11.3, 11.4, etc.) is determined by students’ final exam scores. The stakes aren’t quite so high for underclassmen, so they’re allowed to go home at night, but I guess some misery is still in order. The style of testing is pretty formal. Each exam for each level as its own test booklet with an official time limit. Proctors track the passing of time on the chalkboard, ands students it in equidistant row s and columns that have a military rank-and-file feeling. The process is cloaked in an intimidating air. It’s everything short of the “make your mark heavy and dark” speech. On the other hand, despite the authoritarian feel, there is rampant pushback from students. Conversations are whispered and White-Out is traded back and forth—occasionally it’s flung across the room. This could be a reflection of my lax discipline policies. I’ve heard stories from other volunteers in which students’ tests were ripped up on account of cheating. I prefer to lob empty threats. I’ve enjoyed this week quite a bit myself. I’ve read a lot, and the hours of silence are a welcome change from my usual mornings spent bantering about Excel for hours on end. No lesson-planning is necessary, which is probably my favourite part. The only downside (and it’s a whopper) is that Friday afternoon I will be given a pile of 500 tests to grade. But until then, I will sit in blissfully ignorant silence. And it will be good. 11.1 taking the maths exam (11.2 is pictured up top.). 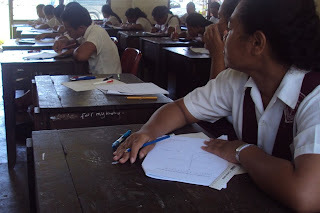 The front row of 11.1 taking the maths exam ("Maths" means "math" in New Zeanglish.). I noticed Kinny is left-handed. Apparently that's not frowned upon here. Cool. Ahhh....I remember those days of sitting and taking the PSSC...fun times:) I hope your students do well and get the chance to go to UPY. New Zenglish :) Awesome Matt! Great post, have a great weekend.